What if Quake, but with cowboys? An interesting proposition and one which developer Lunar Rooster have set out to answer. 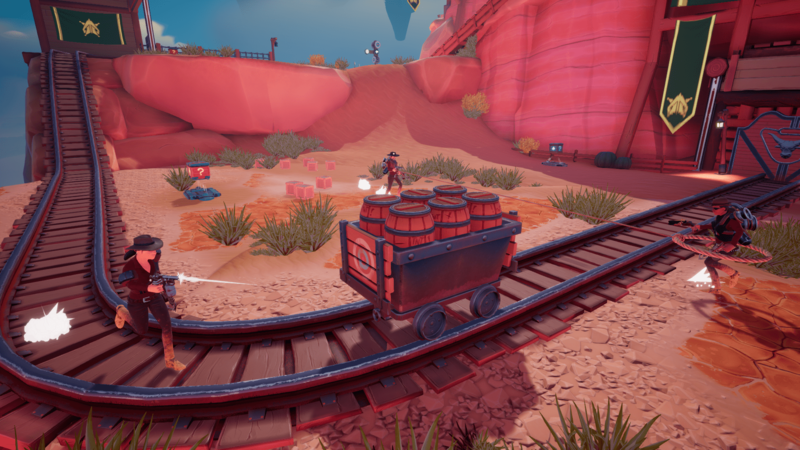 Their upcoming action FPS, Sky Noon drops players into a reimagined, Wild West styled, floating frontier. Here they will fight it out with their fellow cowpokes for control of the world’s finite water supply. Players participate in multiplayer aerial mayhem with a singular objective for survival. Don’t fall off the edge. Unlike most shooters, Sky Noon’s guns aren’t lethal. Instead players shoot powerful compressed air at each other as they battle for control of the floating landscape and the precious water it contains. These highly concentrated bursts of air send opponents careening across the screen as they scramble to find solid ground again. Despite the lack of bullets the guns do offer a variety of options. Players can choose from endless machine pistol bursts or wide-spreading shotgun blasts, among others. Coupled with character customization options, players are able to personalize their appearance and loadout to fit their playstyle. Sky Noon offers 2-8 player game modes; including Free For All, Team Deathmatch, and King of the Hill. In each match, lassos and grappling hooks serve as literal lifelines to pull players back from the edge. This makes for frantic gameplay as players struggle against both the terrain and each other. The lack of health bars keep the UI to an absolute minimum with players relying on steam-powered jetpacks, jump pads, and teleporters to swiftly cover the map. The cartoonish style and lack of violent content keeps the competition’s focus, fun and friendly as players continuously go flying. This is Lunar Rooster’s first title. They’ve teamed up with Reverb Triple XP to bring the Sky Noon Closed Beta to fans next month. Players can sign-up at the Sky Noon website and join the devs on Discord for upcoming dates and details.